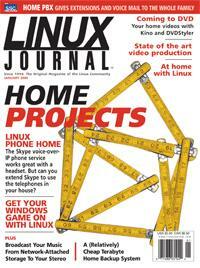 There's a call for mom on extension 9 now being routed to voice mail, all thanks to Linux, Asterisk and Digium. There is a surprising plethora of Linux tools available for manipulating images, creating and editing videos. What are they and how do they stack up? A terabyte backup system for 80 cents per gigabyte? Hardware has gotten cheap enough to make it worthwhile to create a terabyte backup system for your home videos, music and other data. Want to turn those home movies into world-class DVDs? Here's how to edit them in Kino and use DVDStyler to create the final masterpiece. Don't trip over wires in your home just to listen to your MP3s. Attach a Roku Labs SoundBridge to a Network Attached Storage device to broadcast the music to your stereo. Want to extend your Skype voice-over-IP phone service to the telephones in your house? Here's how. Use Linux to create a circuit board design. Send files to a fabrication house and, voilï¿½ what you get back is a professional quality circuit board of your very own design. Enlightenment is still alive and kicking keister in graphics performance. Here's how to use the Enlightenment rendering engine with GTK2.